I hope everyone had a wonderful Christmas and New Years. I know that I enjoyed my time off work. It was so nice to have the chance to go home to Michigan and be with family. Now it's back to normal life. I have to admit that I haven't been great at taking pictures of all my maternity outfits recently. It's kind of hard to keep up with that when you're living out of a suitcase. Luckily, before I packed for my trip, I took pictures of the outfits that I planned to wear. I thought I'd share some of the outfits that I actually wore last week. 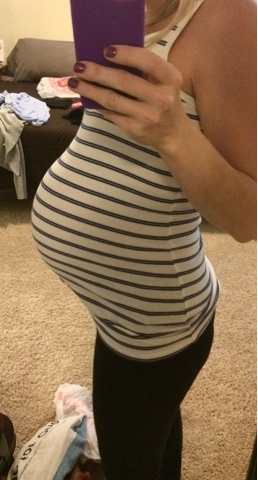 Here is a bump update for the last 2 weeks. I can definitely tell that I'm in my third trimester. I have a month and a half left to go before I get to meet this little guy. He's welcome to come a little early if he wants (of course not too early though). The reality that I'm going to be having this baby soon is starting to set in, and I'm not going to lie, it's a little scary. Even though I'm a little bit terrified of the pain of child birth, I just keep thinking of all the women who have done it before me. I've never heard a mother say that the pain wasn't worth it in the end. As you can see by the pictures this baby boy is getting quite large and I'm feeling it. I'm missing my little second trimester baby bump. It was much more manageable and easier to dress. 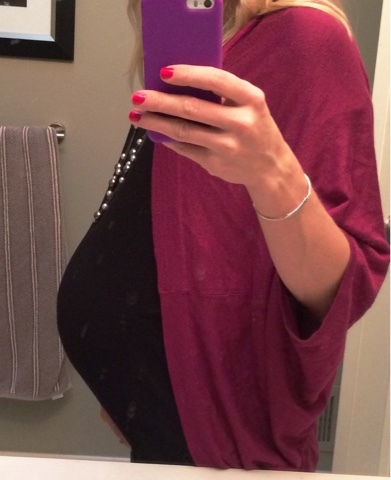 That's alright though, because I'm up for the challenge to find cute ways to dress this big third trimester bump.